My translation of Tatjana Flade’s interview with Sergei Voronov. 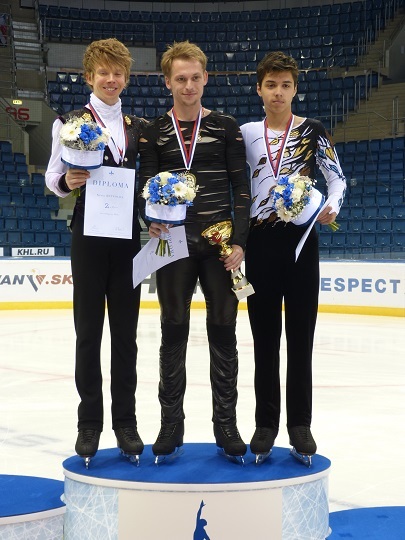 About his performance at Ondrej Nepela Memorial, absence of his new coach at the competition and new programs. Sergei, congratulations, it’s your first competition of the season. – Thank you. But this is not my first competition. Before that, I competed in Samara at the Cup of Russia. – International – Yes. I’m happy with the place, but it was hard to perform. Two consecutive start. I flew from Samara, the next day flew here, the next day was short program … In fact there was a one day break between competitions. But you know, it tempers! I performed here without coach. And I would like to point out Sasha Smirnov’s help. He helped me a lot. I’m very grateful him that he putted me on the ice and how he did it. I didn’t think that a person who is still skating himself can put on the ice another athlete. This is not just praises, it’s a reality. If all goes well, then Sasha will have a brilliant coaching career. How exactly Sasha helped? Did he say something special? – Just humanly helped. Without ponte, like a man. Really. And with jokes. What was necessary, I caught the idea of what he suggested me. Especially before the start. Those words and how he said that, it was really cool. Why your coach wasn’t able to come? – Inna Germanovna (Goncharenko) congratulated me on the phone. We are constantly in touch. Those who did so, that she could not come, can rejoice. Although therei’s nothing to rejoice, they should be upset. I’m first. How difficult it was to be alone? – Of course, it’s difficult. I recently moved to Inna Germanovna. Then we went to Samara. Everywhere I was with coach. In Sochi, at the test skates I also was with coach. And then … happened that nobody needs me. Yes, I’m an adult athlete. But any athlete needs support. It’s necessary that someone looked at you, showed some things, even banal. It’s necessary. But it turned out that I came here and didn’t know whom of coaches I can ask. One coach – I trained with him before, so it’s uncomfortable. The second – I also trained with his. The third has his own business. But in the end it turned out great! It’s important for me when there are difficulties, but you was able to overcome them. It’s not important how many points I got. It’s important that I can overcome difficulties. People have been trying to write me off for a long time, but I don’t think I did everything that I can. Did you asked Sasha Smirnov to stand behind the board? – Yes, at practice. He sat on the stands, I came to him, explained. He immediately responded, saying, “Of course! Water, napkins, what do you need?” Then I asked him also to stand behind the board at competitions, he kindly agreed. It was strange and unusual – a man with the name, who is still an active athlete and putting on the ice another athlete. What do you think about your performance in Bratislava? – I estimate it positively, because, firstly, I managed to do clean quads. Secondly, there were difficult circumstances, and I was able to pass through them without any serious errors, performed both programs at a normal level. Yes, this is not the limit. We can’t relax and must continue to work. I’m helped with this. We have excellent coaches, a good group. You moved to a new coach, what has changed in your preparation? – Inna Germanovna (Goncharenko) and Eteri Georgievna (Tutberidze), both have their own approach. But with both of them you have to work hard. Perhaps, they have something different in their approaches, but the secret is actually simple. If you work as a damn, something probably will turn out. If you frequently change coaches saying that this one is bad, this one is not what I need, unlikely that something good will turn out. I realized this thing not so long ago. Unfortunately, many things come with age. Appears an understanding what you have to do, how much, where you have to limit yourself, break, torture, and where there is necessary to do something else, to switch … It’s an experience. Experience is priceless. But it comes with age. You train in a group with Maxim Kovtun. Does he motivate you? – I don’t know whether I motivate him, but for me Max is the best, perfect sparring partner in Russia, I could only dream of. I say this without sarcasm. Kovtun has a whole set of jumps, he shows it at practices. The first start is over, what’s next? – To work, to endure and overcome myself. I hope my next start is “Skate America”. Why hope? Didn’t you go? In figure skating Russian athletes have been always treated well. – Honestly, I was going to this tournament with the idea to look, whether there will be any cues from journalists on this subject. After all, these scandals made a black spot on the Russian sport. Am I wrong? – Short program we did to the music from the movie “The Skin I Live In”, where the main role is played by Antonio Banderas. The film is psychologically difficult, about a surgeon who has experienced a personal tragedy, after which he became a little crazy. I try to show it. The free program – «Muse», the third part, the music (as someone said, and I repeat), which “breaks you into molecules”. While I didn’t manage to show it properly. But it gives me internal energy. – Yes, but they turned it on quiet. I skated to a whispering. You skated in old costume. Are you going to change it? – Yes, costumes are old, shabby, but they survived. Of course, will change. On “Skate America” will be well-dressed.